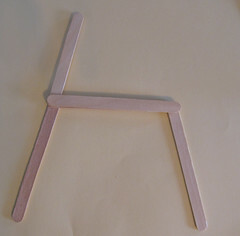 Nikki’s Popsicle Stick Llama Tutorial. One of my favorite things about knitting and other fiber arts is that they have increased my awareness of where things come from and how we connect back to the materials that we use in our everyday lives. Basically, I like knowing that the wool I’m knitting with came from sheep, or alpaca yarn from an alpaca. I’m especially entertained by skeins of yarn that come with a name – the name of the animal the fiber came from. This, in turn, has made me especially entertained by depictions of these animals, or the chance to see them in real life. I have several shirts from Threadless.com with sheep in them, and have started doing things like going to the Wisconsin Sheep & Wool Festival (though I regrettably missed it this year). So, when trying to come up with ideas for my Amazing Animals class, I became extra excited when I thought of doing llamas! Having discovered that the kids really enjoyed having an arts and crafts component to the class, I thought long and hard about how they could make llamas. 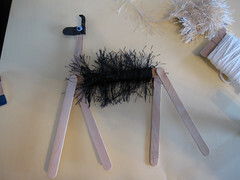 And that is how the popsicle stick llamas came to be. 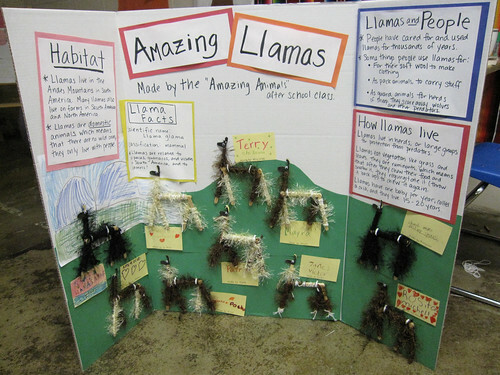 For my class, I pre-assembled the llamas beforehand and then let the kids apply the “fur” in class. However, if you have more time and less kids, the whole project is not too hard for a kid to do by him or herself. 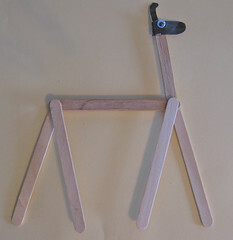 How to make a popsicle stick llama! 1.) Body and neck: Take 3 popsicle sticks. Cut one of them about an inch from the end. Using white glue or super glue, glue the longer piece to the end of one of the other popsicle sticks at a slightly less than 90 degree angle. 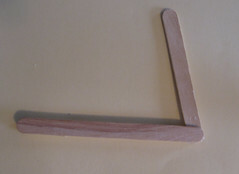 Glue the smaller piece to the other end of the popsicle stick, lining it up with the end. 2.) Take the 3rd popsicle stick and glue it on top of the neck piece and small cutoff piece, creating a sandwich. This creates the body and the neck. 3.) 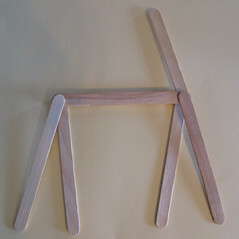 Legs: For the legs, you can either choose to glue all four in place at once and hold them until they dry, or do one side at a time and let the llama sit to dry, then do the other two legs on the other side once it is dry. I chose the second way since I was making several llamas at once, but first I lined up all the legs to find out what angle I wanted them to be at. I will describe that method here. 5.) Next, glue the legs on one side. I started with the ones that angled outward. Lay it flat on the table, legs side down so they don’t tilt out of place, and let dry. 6.) Once the legs have dried enough to hold in place, you can do the other set of legs. Glue on the legs that angle inward, and flip the body over so that these new legs are face down on the table, and let dry. You can do a test before you lay the llama down to make sure the legs will all stand evenly on the table if you want. 7.) 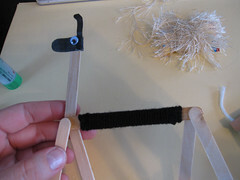 Llama face: To make the llama face, fold the piece of black construction paper in half and trace the end of a popsicle stick, making it about an inch and a quarter long. Cut this piece out. 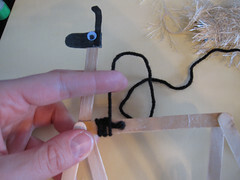 Dab a little bit of glue on the top of the popsicle stick neck and fold the paper around it. Glue the ends of the nose together. 9.) Now comes the really fun part, the fur! For my example, I’m going to make a black and white llama. Since I did this project with a group of kids, I wound the yarn onto small bobbins that I made out of cardboard from cereal boxes instead of using the whole skein of yarn. I recommend winding these small bobbins anyway, since it was not very hard to control the yarn while I wound. 10.) Now is when you use the glue stick. Do one body part at a time to avoid getting too sticky. I will start with the llama’s body. 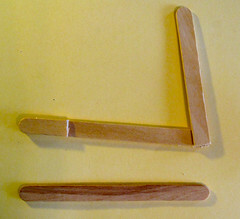 First, apply glue up and down the length of the body on both sides of the popsicle sticks. Using the worsted weight yarn, stick the end of the yarn onto the glue and begin to wrap, securing the end by wrapping around it. 11.) When you reach the end, cut the yarn and apply an extra blob of glue to secure it, if needed. You have your base wrap! 12.) 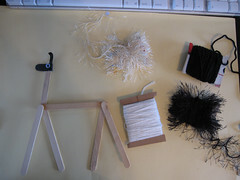 Now, again with the glue stick, apply glue onto the wrapped yarn and repeat the process with the fun fur. You shouldn’t need too much glue except to secure the ends, but too much won’t hurt it either, besides getting your hands pretty sticky! 13.) 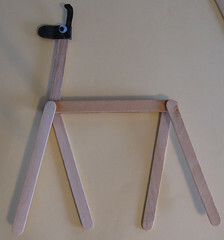 Repeat the same process with all of the legs and the neck until you have a finished llama! Be careful when applying the glue stick to the legs that you don’t snap the legs off the body. I ended up having to go back and super glue a bunch of kids’ llamas in between classes because of this. When your llama is finished, enjoy! 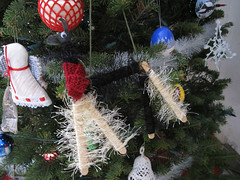 I decided to add a scarf to my example llama and make him into a Christmas tree ornament! « The trouble with tourist yarn.